I don't know why I always feel compelled to tell you why I read a book before I tell you what I think of it, but the trend continues. I went to the library a while back, trying to find books on South America for a story I want to write. I had no specific idea about what part of the continent I wanted to focus on or what civilization would suit my story so I picked up stuff on Mayans, Incans, Aztecs, and so on. For awhile I was sure that Machu Picchu made the most sense but I need a location that is more isolated and more jungle. I happened to see this book on the shelf and the name was so striking that I picked it up. I finally got around to reading it this last week and it was turned out that it had the perfect location and people for my story. On top of that, it's a fascinating read and it's all true. The author is a journalist/author who writes about archaelogy and other science stuff along with mysteries with Lincoln Child. I had never heard of him but I would happily read more books by him. He's got an easy style and knows how to keep things interesting. 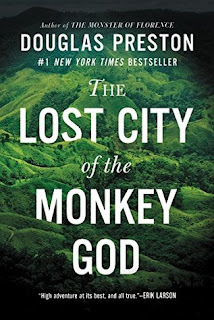 The story begins with some background about the past attempts to find the White City, also known as the City of the Monkey God. 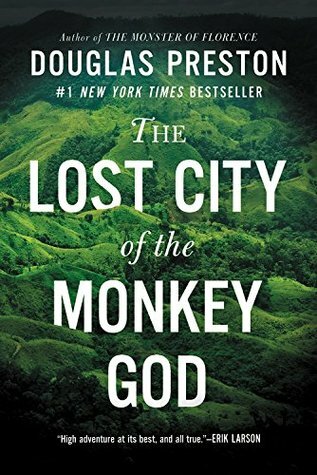 One explorer and his partner supposedly found it back at the beginning of the last century, a story that was accepted as fact until this author got his hands on the journals written by these two men in which they detail their time spent in the jungle, panning for gold instead of looking for the lost city. When they returned to civilization they lied about finding it and no one questioned their story. The only reason these journals got out was because the one explorer's nephew went to prison and his wife loaned them to the Smithsonian. The Smithsonian people never even opened them so it's entirely possible that no one would have known about the deception if Preston hadn't found and exposed them. That is the kind of stuff you can't even make up and it's just the start. The archaelogists involved used very expensive military technology involving lasers and radar to identify potential dig sites in the deep jungles of Honduras. These sound like some really awful jungles with deadly snakes, quicksand(mud), killer bugs, and jaguars. Against all the odds, the team makes more than one world-shaking discoveries and along the way encounter all of the dangers listed above. Even when they return to the states their adventures are not over as many of them contract an incurable, potentially lethal disease. The book ends on a sour note as the author warns us that this disease is moving up into the states and may soon threaten all of us. That was a bummer ending I could have done without. For a non-fiction book, this is a fairly fast-paced story with lots of drama and surprises. The controversy raised by rival scientists when they return reads like something out of the best fiction. For the record, I think their detractors are idiots, but maybe that's because they didn't bother to learn anything about the expedition before denouncing them as publicity hounds. If anything, I think this expedition didn't get nearly enough attention since I had never heard of it before reading this book and I couldn't find anyone else who had, either. This should have been much bigger news. Don't wait for your news outlets to tell you this story, read the book. I think you'll enjoy it. 4 stars of fascination and horror.